Earmarking the year beginning with the Malayalam month Chingam, welcoming back King Mahabali on his annual visit to his homeland is ONAM, the ten days festival celebrated in a pomp manner in Kerala. Onam is very close to the heart of the People of Kerala; Onam festival is celebrated between 25th August and 6th September in 2017. According to Hindu mythology, King Mahabali, The grandson of King Prahlada, who was a staunch devotee of Lord Vishnu, conquered the celestial rulers called the Devas. They pleaded to Lord Vishnu to save them. But the Lord denied to come to their rescue but consoled them that he will try on an opportune moment. On his victory over the Devas, King Mahabali arranged for special prayers and promised to his citizens that he will grant whatever they wanted on the day of poojas. Lord Vishnu went to the venue disguising himself in the form of a small boy. He requested the King to grant Him three pieces of land and the King agreed. Instantly the God covered the earth and sky with his two feet and asked the King for the third piece. Realizing that it is the Lord who has come to grace him, King Mahabali offered his head for the third piece of land. Lord Vishnu was very happy accepting his devotee’s request and blessed him with a boon that he can come back and visit his place and people every year and that period is celebrated as Onam by Keralites. There are many other legends leading to the celebration of Onam. The festival Onam is not only for the Hindus, but also for the Christians who give a warm welcome to their King. Grand celebrations are arranged in churches. Though the Islamic preachers taboo the celebrations, most of the Muslims prefer being a part of this festival. 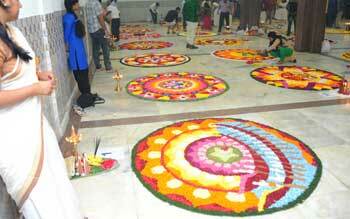 Festival of Onam commences on the day with star Atham and lasts for ten days. The rituals are marked with the poojas done for Vamanamurthy in the Thrikkakara Temple situated in Kochi. The celebrations are flagged off with grand processions in a place called Thirupunithura and named as Thiruppunithura Achthamayam. The epicenter of the entire celebrations is focused on Lord Vishnu and king Mahabali and exhaustive prayers are offered at Vishnu temples across the state. The beginning of the celebration is reflected in the form of flower decorations in every house and temples called Athappookkalam. The flowers endemic to Kerala are used in this. The size of the flowers used is very small on the first day and it grows in size as days pass by. On the 10th day with the star Thiruvonom, you can see very big decorations everywhere in Kerala along with firing of crackers. In every house, there are small statues or figurines of Vamanamurthy and Mahabali worshipped on all the ten days. This can be likened to the Lord Ganesha statues worshipped on the day of Ganesh Chathurthi. Forms of traditional dances like Thiruvathira, Kummattikali, Pulikali, Thumbi Thullal, are performed everywhere and competitions are also conducted. Snake boat races called Vallamkali are conducted attracting huge number of tourists from across the world.Describing Onam will not be complete if Onamsadya is not mentioned. It is the grand feast arranged in every house on the last day of the Onam. “Kannum vittum onam unnanum” is a world famous proverb meaning that a Keralite should anyhow prepare or at least attend the feast Onamsadya without fail. It is a grand feast prepared with a minimum of nine dishes, rice and ended with desserts. The number of dishes may even go up to 40. Mahabali statues worshipped at houses are let into the nearby rivers or waterbodies as a post onam celebrations marking that King Mahabali returns to Paadhalaloga. Elaborate arrangements are made by the Government of Kerala in major cities like Trivandrum and Cochin. People do huge shopping and enjoy the festival with reunions of friends and families. As we all know well that Keralites are everywhere in the world, grand celebrations are carried out in USA, Singapore, Malaysia and Dubai. Onam is a celebration to inculcate harmony and peace in the mankind.